is a writer and editor at Cactus Wren Writing, and the co-founder of the Farm Education Resource Network. She writes flash and short fiction, personal essays and creative non-fiction, and her work appears in Edible Baja Arizona. She lives in Tucson, Arizona. For many on the inside of the local food movement, such instances of misrepresentation are too common. The underlying issue is that, in the rush to satisfy the enthusiasm and demand of local food consumers, we have forgotten about the people who drive the entire system: the farmers. The United States Department of Agriculture (USDA) reported in 2015 that the number of farmers’ markets increased by 180 per cent between 2006 and 2014. On the surface, that seems good. But the explosion of farmers’ markets has been driven by consumer desire and convenience. The economic realities for farmers still sit uncomfortably alongside the practice of many farmers’ markets. When an entrepreneur decides to open a farmers’ market – or a restaurant based on the concept of farm-to-table – without first considering whether the region has enough farmers able to support such a venture, the result is a scramble to fill the new marketplace or restaurant with food that can pass for local. Misrepresentation often follows. Despite the popularity of local food, the average farmer is not thriving. During the years in which farmers’ markets took off (between the 2007 and 2012 Agricultural Censuses), the US lost 4.3 per cent of its farms, continuing a downward trend that began in the 1950s. This year, farm-sector profitability is forecast to decline for the third year in a row. Net farm income is projected to go down, as are farm asset values. The projected median farm income for 2016 is negative $1,473. Just about the only statistic projected to rise in 2016 is farm debt. Farmers will continue to rely on off-farm income to pay their bills. They will choose loan payments over savings accounts, chicken feed over dental care. They will face the heartbreaking decision to leave their farms. While local food has emerged as an alternative to industrial food, many people have simply transferred their expectations from the grocery store to the farmers’ market. Consumers still expect a global array of products, despite natural restrictions in season or geography. Additionally, emotional expectations surrounding food have increased. People want to imagine chickens free-ranging in a pasture without knowing anything about their deaths. They want their farmers to be simple, iconic food heroes. It is awkward to burst the bubble of this romantic image by raising issues that will make or break the entire movement: wells running dry, the ballooning stress of our producers, the fact that farmer suicide rates are twice that of the general population. There are farmers’ markets that require vendors to declare the origin of their products, or simply don’t allow resellers. There are also great restauranteurs who are honest in their advertising and who buy regularly from local farmers. But there are also plenty of businesses exploiting the popularity of the local food movement. Certainly, I believe we are warranted in calling out the restaurants and farmers’ markets that are blurring the line to satisfy a public that wants to support local food, and yet who is often disconnected from seasonality and the realities of food production. Consumers should be dogged in insisting that food be represented accurately. This includes asking questions and requesting labelling programmes at farmers’ markets. It also helps to know about crop seasonality in your region. Watermelons appearing at winter farmer’s markets were not likely grown anywhere in North America, much less locally. It’s up to consumers to advocate for policies that allow farmers to succeed. If you care about artisan cheese wheels, you should care about dairy prices. If you enjoy getting your weekly Community Supported Agriculture share, you should support programmes that increase the economic viability of our farmers. Obvious options include expanding Individual Development Accounts for beginning farmers and adding farmers to the Public Service Loan Forgiveness programme through the Young Farmer Success Act. Funding for crisis lines and behavioural health resources for farm families is insufficient and should be increased. Doing so acknowledges that the wellbeing of farmers is directly related to the availability of good food. Land trusts can work with farmers to reduce land costs through tools such as conservation easements, but this requires funding and often political support. 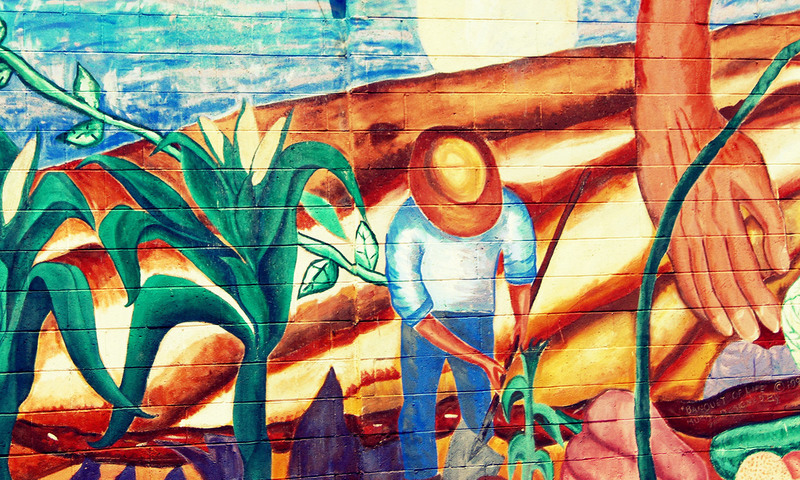 Local or not, food systems are built on the backs of people. While the conventional food system offers the magical illusion that food exists in a vacuum, removed from the human beings who raise it, the local food system is an opportunity to create a connection between eater and producer. But with that opportunity comes a responsibility to ensure that our farmers and their needs remain at the very centre.